The market moved below 1.1837, thereby invalidating the main triangle count and confirming the alternate count. Price so far has reached 1.1717, exceeding our first target 72 pips, which gives us two possibilities. The new main count sees that there’s still room on the downside for another small decline to complete this correction. On the other hand, the alternate count makes the case that the correction is already complete, and examines the possible targets of the new rally. The bigger picture sees that the euro is moving toward the upside in maroon wave B, which is forming an expanded flat labeled black waves A, B and C.
Black wave (C) is forming an impulse labeled blue waves 1 through 5. Blue wave 3 is forming an impulse labeled pink waves i through v.
Pink wave iii formed a very strong impulse labeled green waves (i) through (v). The main daily count sees that pink wave iv is forming a flat labeled green waves (a), (b) and (c). Green wave (b) formed a running flat labeled orange waves a, b and c.
Green wave (c) is forming an impulse labeled orange waves i through v.
This count expects the euro to be moving toward the downside in green wave (c) to complete pink wave iv. This will be confirmed by movement below 1.1717. At 1.1636 green wave (c) would reach 161.8% the length of green wave (a), then at 1.1541 it would reach 200% of its length. 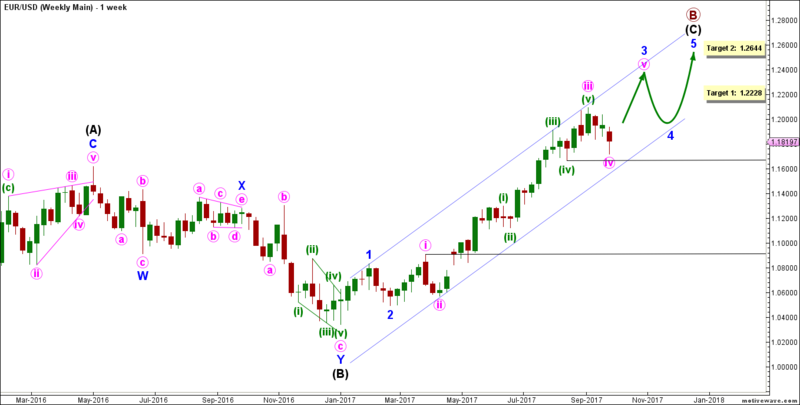 This wave count is invalidated by movement below 1.0906 as pink wave iv of this impulse may not enter the price territory of pink wave i. It’s also invalidated by movement above 1.1861 as orange wave iv of this smaller-degree impulse may not enter the price territory of orange wave i. This alternate daily count sees that pink wave iv formed a flat labeled green waves (a), (b) and (c). Green wave (b) formed a contracting triangle labeled orange waves a through e.
Pink wave iv overall retraced 23.6% of pink wave iii, and it’s now complete. 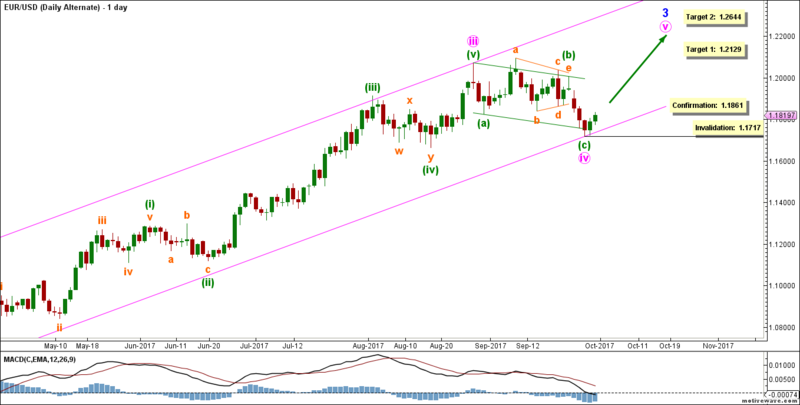 This count expects the euro to be moving toward the upside in pink wave v. This will be confirmed by movement above 1.1861. At 1.2129 pink wave v would reach 100% the length of pink wave i, then at 1.2644 it would reach 61.8% the length of pink wave iii. 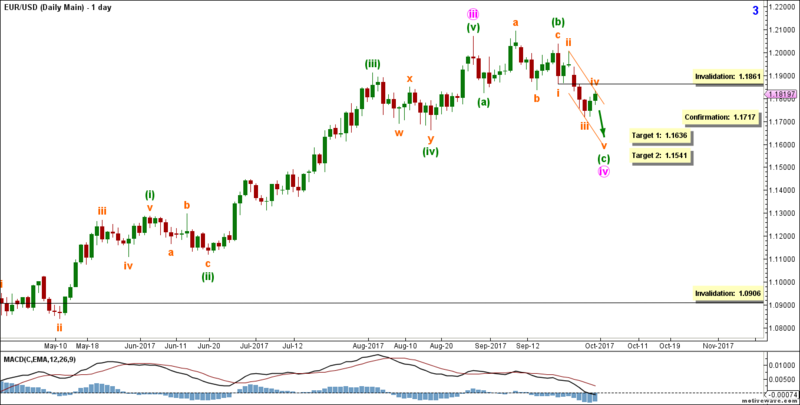 This wave count is invalidated by movement below 1.1717.